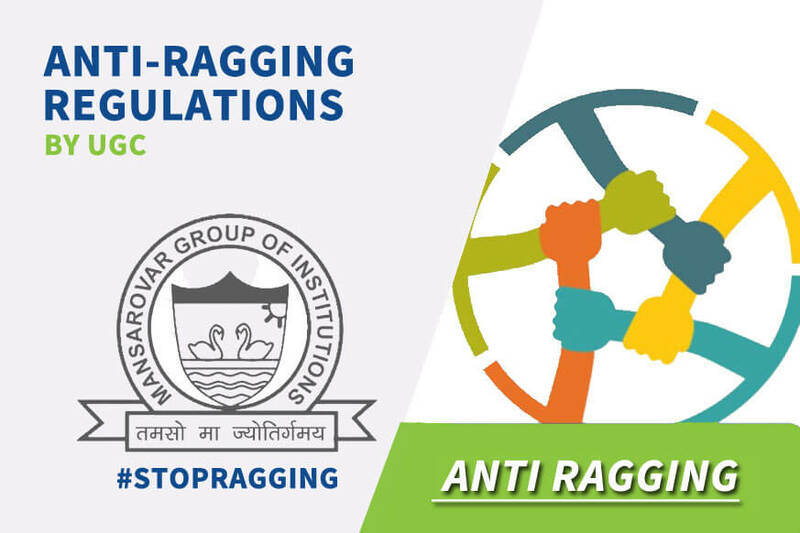 Ragging is neither a means of familiarization, nor an introduction with freshers, but a form of Psychopathic behaviour. Ragging is a violation of Human Rights. Respect Humanitarian Values.Ragging is a heinous crime, heavily punishable under law. Ragging may spoil your career for ever. 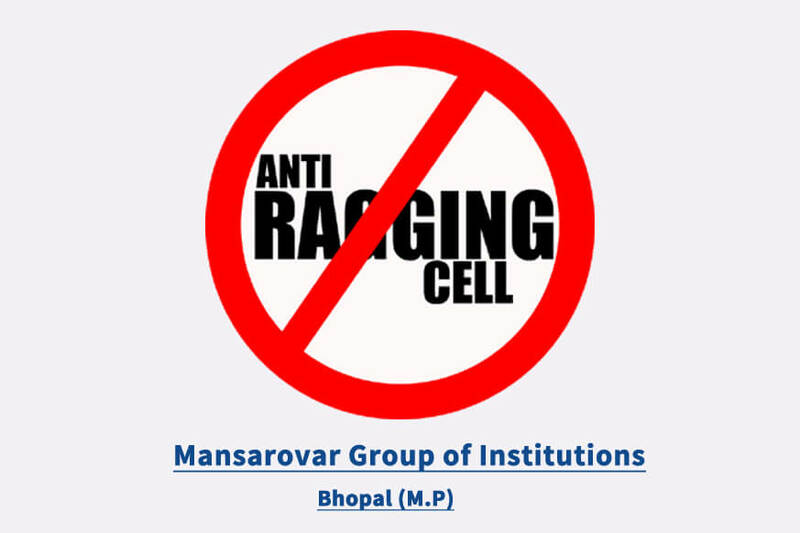 Mansarovar Group of Institute, Bhopal is a NO RAGGING ZONE with ZERO TOLERANCE towards any incident of ragging, by preventing its occurrence and having appropriate measures to curb any incident of ragging. To force look at pornographic pictures to shock the freshers out of their innocence. To force to do acts which can lead to physical injury/ mental torture or death. Annoyance, hardship, physical or psychological harm or to raise fear or apprehension thereof in any fresher or any other student due to indiscipline activities by any student or group of students. Any act of financial extortion or forceful expenditure burden put on fresher or any other student. Any act of physical abuse including all its variants like obscene and lewd acts, gestures, danger to health, sexual or homosexual abuse etc., on fresher or any other student. Any act or abuse by spoken words, emails, posts, public insults which would also include deriving preventive pleasure, vicarious or sadistic thrill from activity or passively participating in causing discomfort to fresher or any other student. Act that affect mental health or self-confidence of fresher or any other student. Mansarovar Group of Institute, Bhopal shall abide by regulations and norms laid by RGPV/AICTE/UGC Regulatory Authorities and any other authority as applicable Government of M.P. Fines of more than Rs.1,000/-, if any 3rd Sem students found travelling by College Bus with 1st Sem students (for any reason whatsoever). Rigorous imprisonment and fine upto Rs 2.5 Lakhs as per Law. Punishment(s) in The Event of Ragging Any One or More of The Following Punishment May be Awarded. Debarring from appearing in any test/examination or other evaluation process. Withholding results. Rustication from the University/Institution for period ranging from one to four semesters.